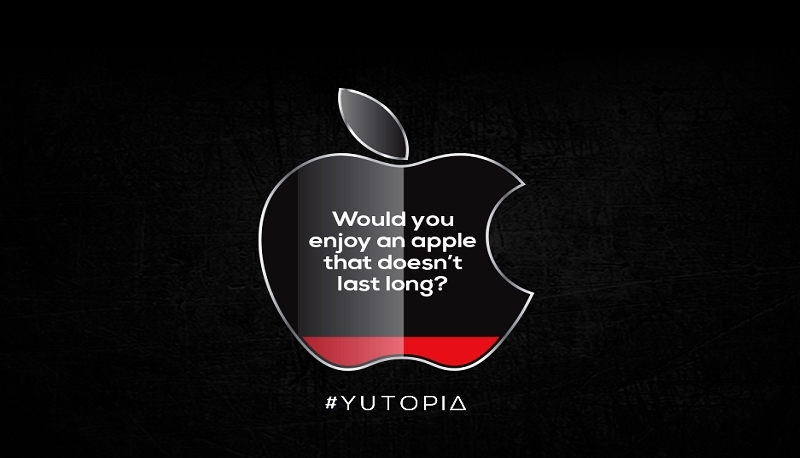 Yu has once again made Apple its target in the latest teaser for its upcoming Yu Yutopia smartphone. The image hints towards the smartphone’s battery capacity as compared to those found in iPhone models. The teaser shows the Apple company logo with low battery indication and a caption stating, “Would you enjoy an apple that doesn’t last long?” The teaser directly hints at the size of the Yu Yutopia’s battery to be greater than the latest iPhone models. The image however, says nothing more about the smartphone. The company tweeted the teaser image saying “High on price, low on juice! High time; #ThinkDifferent #RaiseTheBar! #Yutopia.” Yu Televentures has also started letting interested users register for the Yutopia on its dedicated website. So far, the company has confirmed that the Yu Yutopia will include 32GB of inbuilt storage instead of 16GB, which is still the minimum inbuilt storage given by Apple in its iPhone models. Previously, the company confirmed a Quad HD display on the Yu Yutopia smartphone. If true, this would be the company’s first smartphone featuring a QHD display. The company also hinted that the Yutopia would sport a metal build which would be company’s first smartphone made out of metal. It recently took dig at the OnePlus 2 smartphone, which doesn’t support the Quacomm Quick Charge feature. To recall, ahead of the Yu Yunique launch in September, a high-end smartphone from dubbed Yu550 was spotted in Geekbench listings as well as at an Indian import/ export manifest site. The Yu550 may be the high-end smartphone the company has been teasing. To recall, the Yu550 smartphone spotted at Geekbench listing showed few specifications including a 1.5GHz octa-core Snapdragon 810 (MSM8994) processor coupled with 4GB of RAM. The smartphone was said to feature a 5.2-inch full-HD display and run Android 5.1.1 Lollipop-based build of Cyanogen OS. The Yu5050 scored 1353 in single-core test and 4622 in the multi-core test.